The research report, titled “Phytosterols Market - Global Industry Analysis, Size, Share, Growth, Trends and Forecast 2015 - 2021”, further estimates the global phytosterols market for rise at a CAGR of 8.60% during the period from 2015 to 2021, developing from 18 mn tons in 2014 to 32 mn tons by 2021 in terms of volume. Transparency Market Research (TMR), a market intelligence and research firm, has recently announced the publication of a new market study on the global phytosterols market, stating that the overall revenue generated by this market in 2014 was US$473.8 mn. Analysts at TMR estimate this market to expand at a CAGR of 10.0% between 2015 and 2021 and gain US$926.7 mn in terms of revenue by the end of the forecast period. The increasing incidence of death caused by heart diseases has propelled consumers to shift their focus towards healthy eating. 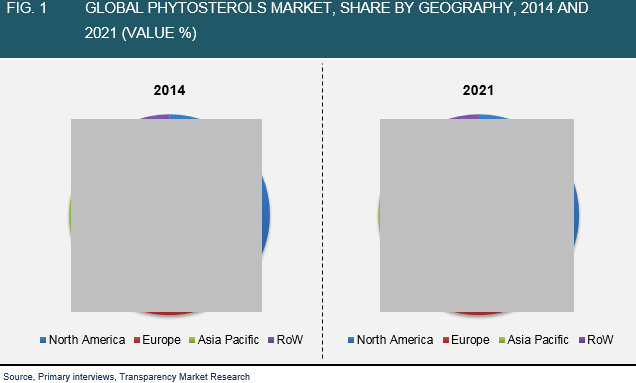 The rising awareness in developed nations pertaining to health benefits offered by phytosterols has fueled the global phytosterols market to a significant extent. However, the dearth of knowledge regarding the same in emerging economies is holding the market back from growing smoothly. The report analyzes the worldwide phytosterols market on the basis of products and their applications. B-sitosterol, stigmasterol, and campesterol are the key products available in this market. Among these, the B-sitosterol market holds the leading position in the global phytosterols product market and the campesterol market occupies the second place. Analysts expect these markets to retain their respective positions, registering significant growth in the market share, notes the market study. Food ingredients, cosmetics, and pharmaceuticals are the main application areas for phytosterols, says the market report. Food ingredients have led this market so far and are projected to maintain their lead during the forecast period on account of the wide usage of phytosterols as food additives in beverages, sausages, and bakery products. The global phytosterols market has also been analyzed on the basis of its regional distribution among North America, Asia Pacific, Europe, and the Rest of the World in this market study. The phytosterols market in Europe, which holds more than 40% of the overall market, is the current global leader. This regional market is likely to maintain its dominance over the forecast period. The North America phytosterols market has occupied the second position at present. However, the market in the Rest of the World is anticipated to report the fastest growth throughout the forecast period. The rapid development of the phytosterols market in the rest of the world is due to the rising awareness among consumers regarding the benefits phytosterols offer. Additionally, the increased usage of phytosterols enriched products in the medical and healthcare industry, on account of the growing incidence of coronary heart diseases, is likely to fuel the demand for phytosterols in the Rest of the World region over the next few years. According to the market study, the worldwide phytosterols market is highly competitive. Pharmachem Laboratories, Cargill Inc., Arboris LLC, E.I. DuPont De Nemours, Unilever plc, Archer Daniels Midlands Co., Triple Crown AB, BASF SE, Raisio plc, and Bunge Ltd. are the key players in the global phytosterols market. Mergers and acquisitions and strategic partnerships and alliances are some key approaches that players adopt to strengthen their presence in this market, states the research report.